Let's counter Italian advertisements with some American advertisements. By and large, American commercial spots are so bad they're practically painful to watch. When I forget to triple-fast-forward on TiVo and accidentally watch a commercial (while in a sofa+beer+TV induced trance), I'm just in awe that what I'm seeing is the best that a team of advertising majors could come up with. It's like every company thinks their target demographic is Nascar-watching hillbilly trailer-trash (and honestly, how much money can the trailer-trash possibly have to spend on your product?). The least they could do is throw in some hot Italian women. There are a few exceptions to the trend of aghastly* bad commercials. 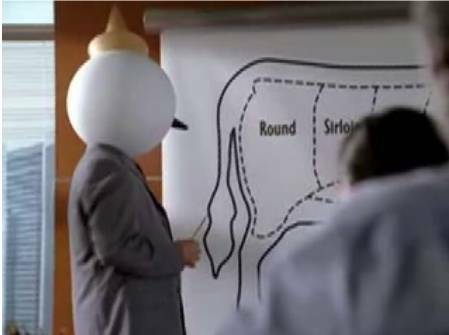 Jack in the Box consistently has brilliant commercials. Their current ad campaign is right on par. They're promoting their new sirloin burger and simultaneously poking fun at other fast food chains that advertise burgers made from 100% pure Angus beef. Of course, the competitors, unable to compete with their advertising departments, are trying to level the playing field with their legal departments. How American of them. CKE, the parent company of Hardees and Carl's Jr, is arguing in their lawsuit that Jack in the Box has gone too far. "They're not being funny," CKE chief executive Andrew F. Puzder said Friday. "They need to stop misleading people about what Angus beef is." Well that should go both ways. CKE also needs to stop misleading people about what Angus beef is. Angus is just a black-colored breed of cow, and I assure you that you can't tell the difference (try age, cut, and what the cow was fed for the difference). It's as if beef coming from a black cow is somehow better than beef coming from other colored cows. Not to mention, it's totally not PC--I think we will all agree that bovine racism is the worst kind of racism. And since we're watching JitB commercials, here's one of my personal favorites from the past. I can't believe someone didn't sue them for that one. * If the President can make up words, so can I. The question would be are their competitors using certified angus beef. There really is a difference. And some other requirements with respect to hump size, quality, etc. That actually does mean the beef is better. Telling you that you are getting sirloin really means nothing as the breed/age/husbandry of the cow is much more important. Sirloin from a Wagyu will always be better than a Rib-Eye from a dairy cow. Most fast food beef does come from dairy cows, so given the choice I'd pick meat from a better breed. Of course saying they have an angus burger doesn't tell us anything it could be the high end rated angus or angus utility. I'm sure the fine print will let you know a little more. Of course I have to wonder why anyone would want a sirloin burger anyway. Anyone who has ever ground their own meat knows that sirloin is too lean to make a tasty burger. The best burger is 1/2 chuck and 1/2 sirloin.